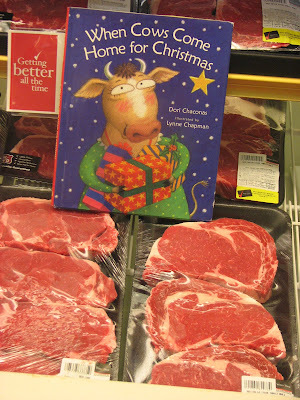 WHEN COWS COME HOME FOR CHRISTMAS....they become dinner! Hey, kids! BUBBLE GUM, BUBBLE GUM won't rot your teeth. And looky here at Lerner Publishing! So far, I've had TWO people send me cross-marketing contest entries. TWO. I'm starting to feel like I'm at one of those awkward, unfabulous book signings and nobody is showing up. In the hopes of inspiring others to be inspired, I have included two additional pictures of my own to the legitimate submissions posted below. Can I do that? I guess I can because it's my contest. bwah! No worries, though...I won't cheat and declare myself the winner of the Sea Monkeys. UNLESS, of course, they can be trained to fetch coffee. In that case, the gloves are off! This first picture comes from the lovely and talented picture book author, Boni Ashburn. (HUSH, LITTLE DRAGON). This next weigh-funny pic comes from editor, Carol Hinz at Millbrook Press, and author Brian P. Cleary (ON THE SCALE, A WEIGHTY TALE). Bok choy, bananas, and books! Oh, my! The world would be a much better place if books were included in the 5 A Day Campaign, no? Good news! With a little help from Benjamin Moore, you, too can have your own blue room! groan! My bad, I know. But I bet you laughed. Many thanks to Boni & Carol for their entries! Here's your big chance! Win your own BOWLFULL OF HAPPINESS! A couple of weeks ago I was having lunch with friends, Lisa Wheeler and Hope Vestergaard. Hope suggested that my picture book HOW TO POTTY TRAIN YOUR MONSTER would probably generate more big, hairy sales in Target if it were strategically placed in the diaper aisle. A little cross-marketing. Of course! 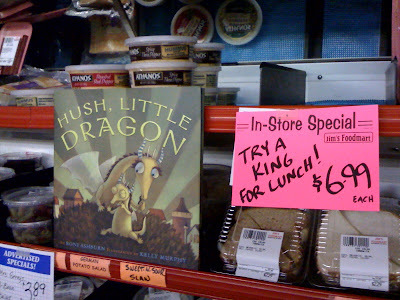 So, that got me thinkin' - in this tough economy, authors & illustrators need all the help they can get. Why not try a little cross-marketing? Number of calories in a sprinkle donut? 300. Number of calories in ARNIE THE DOUGHNUT ?ZERO. I'll have the #17, The Ultimate Porker, a #3, The Totally Tuna - and what the heck, throw in jumbo kosher dill pickle and a copy of FRANKENSTEIN MAKES A SANDWICH while you're at it. Cross-marketing campaigns wouldn't just benefit the book industry. Think of how many more life jackets stores would sell if a copy of BRIDGE TO TERABITHIA were tucked neatly into the straps. I will post them periodically throughout the month of September. 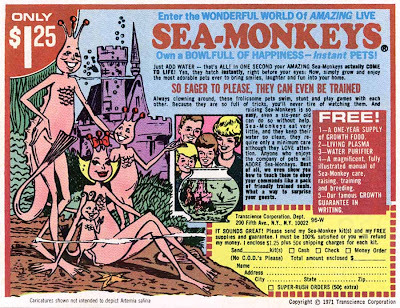 One lucky winner will win their very own frolicsome colony of Sea Monkeys! Haven't you always wanted a monkey? "So eager to please, they can even be trained!" Hmmm...I wonder if they can be trained to write a novel...?? ?